In Homer’s Iliad, every decisive turn of events is engineered by the gods of Greek Literature. In Homer’s Iliad, every decisive turn of events is engineered by the gods of Greek Literature. Whatever the warring mortals plan or execute, it is the will of the gods. As can be seen by several instances through out the Iliad, the Greeks and Trojans often become pawns in the hands of the gods. The gods, although often as bickering and petty as those they manipulate, control the fates and forces that will decide the course of the Trojan War. The will of Zeus and the gods are manipulating the emotions of the mortals to set Achilles’ rage loose. “The will of Zeus was moving towards its end,” Homer reveals, and then asks, “What god drove them to fight with such fury?”. The war, especially the final endgame that the Iliad describes, will be played out because of the gods, and not the men on the field. Book 1 reveals that the start of this final chapter of the war opens with a plague among the Greeks. Agamemnon angers Apollo, and the god sweeps through the Greek camp. “Down he strode from Olympus’ peaks, storming at heart…the god quaked with rage…he cut them down in droves—and the corpse-fires burned on, night and day, no end in sight”. The plague causes Achilles to come out from his tent, and take up arms once again, only to quarrel with Agamemnon. By Book 9, the Greeks are in a “godsent Panic”. Agamemnon sends Ajax and Odysseus as an embassy to Achilles, to end their feud. Achilles is torn, still angered with Agamemnon, but caught in his pre-arranged destiny. The Greek poet, Homer, wrote his epic, The Iliad, about warriors involved in the Trojan War which was fought over 3000 years ago, and the first sentence focuses attention on a man named Achilles who dominates the action. A man of extraordinary strength, Achilles is definitely the strongest warrior in the Greek army, and a tragic hero. At times, he demonstrates great integrity in difficult circumstances, yet fails his countrymen at other times when his emotions affect his actions. 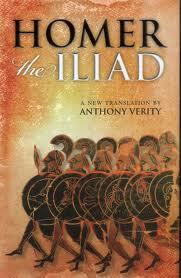 The action of The Iliad starts after years of war between the Greeks and the Trojans. The weakness of the character of Achilles moves the action forward. Achilles’ emotions influence his actions when he is compelled by Agamemnon, the Greek king, to return a young maiden, Briseis, who has been given to him for his valiant efforts during the war. Angered by the actions of the king, Achilles refuses to continue to fight in the war. His anger colors his feelings which affect his actions and the fate of many of the Greek warriors. He seeks vengeance for the actions of the king and has no compassion for the innocent warriors who are affected. He shows his irresponsible reaction when he asks his mother, Thetis, to intervene with the Greek god Zeus, who she once helped, to bring defeat to his fellow Greeks. trap them round the bay and mow them down. So all can reap the benefits of their king–. The request of Achilles to his mother shows that he is a selfish man who would bring tragedy to others because of his own loss. Although the two armies had stopped the hostilities with a truce, Zeus responds to the request of Thetis and intervenes to lead the Trojans in battle against the Greeks. Achilles who is so important to the Greek army refuses to fight with his army. His absence adversely affects the confidence and morale of his fellow Greeks and they suffer great losses in the battle. Although he feels some remorse that his side is losing, his pride keeps him from changing his stance to support them. Instead his young friend, Patroclus, in his armor with his shield, joins the battle. The Greek soldiers are emboldened by the apparent presence of Achilles and they fight more valiantly than before. Patroclus is killed in the battle fighting for the sulking Achilles who realizes the injustice when it is too late to save his friend. Achilles demonstrates that he is a vengeful man who is cruel to Hector and his family after he kills him. As Hector lies dying on the battlefield, Achilles filled with hatred because of the death of his friend, jeers at him and insists that his body remain on the battlefield to rot. He does not want the family to retrieve their relative to cremate his body with the accepted rituals of the time. This causes extreme agony for his family. The grieving Priam, the father of Hector, goes to Achilles to beg him to release the body of his son for burial and pays a ransom to retrieve the body of his son. raise the bier and body onto the sturdy wagon…”. The behavior of Achilles shows him to be petulant, heartless and selfish which does not seem to paint him as a man of integrity and good character. However, in the times he lived, Achilles was respected by others because he was a brave and effective warrior when he chose to do his duty. Other characters in The Iliad, Paris, and his brother Hector show a contrast to Achilles that demonstrates the standards of the people at the time. Paris does not like the role of the warrior and avoids conflict whenever possible. His brother Hector proves to be a brave warrior when he battles against Achilles and has more respect like Achilles from the people at the time. Greek Tragedy - Greek Tragedy research papers examine the function of tragedy in literature. Paper Masters writes custom research papers on Iliad and discuss Homer's classic tale.